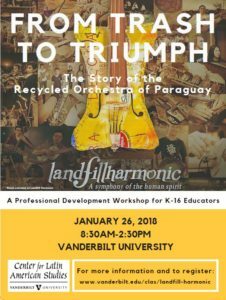 Teachers from across Middle Tennessee joined CLAS as we explored the documentary film Landfill Harmonic, the true story of the recycled children’s orchestra of Paraguay. This day-long workshop included a screening of the film and discussions led by Vanderbilt University Blair School of Music professor Thomas Verrier, and Elvira Aballi Morrell, doctoral candidate in Vanderbilt’s Department of Spanish and Portuguese. Ada’s Violin, a 2017 Américas Award-winning children’s book based on the true story was also highlighted. The workshop concluded with time for participants to develop and share ideas for curriculum inspired by the content of the day. Watch the trailer for Landfill Harmonic here. Download the Workshop Poster (PDF). Registration: $15 — Includes a DVD copy of the film Landfill Harmonic, morning coffee, lunch, and parking validation. Registration now closed. [travel scholarships available] *Free for pre-service teachers!